I watch the movie every Christmas season, it’s a tradition, and a good reminder to review the year just past, and make a course correction, if necessary. This year, I got a writer’s curiosity, who wrote this story, and why? A little research took me on a crooked path. It began with a man named Philip Van Doren Stern (1900-1984), an author, editor and Civil War historian. Philip wrote 40 books, mostly about the Civil War, and he was an editor at Simon & Schuster, and at Alfred A Knopf. As the story goes, Philip woke up one morning in February 1938 with an idea in mind, inspired by Dickens 1843 A Christmas Carol. His idea wound up as a 4,000-word story he named The Greatest Gift. He began writing it in 1939, but didn’t finish until 1943 (writers sometimes get blocked that way). And then, no one would publish it. So what does a writer do under those circumstances? He printed 200 copies himself and sent them out as Christmas cards! That was December 1943 (follow these dates). One of these little goodies came to the attention of a producer at RKO Pictures, who showed it to Cary Grant’s agent, who thought the lead role might be good for him, so RKO purchased motion picture rights for $10,000 in April 1944. Next, screenwriters “adapted” it, Cary Grant made a different movie, and Frank Capra’s company bought it from RKO for, guess what, $10,000. 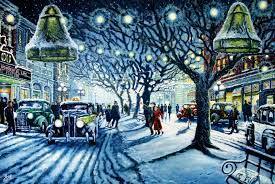 Capra brought in FIVE writers to “polish” the script and renamed it It’s a Wonderful Life. The script had many re-writes, even during filming (sounds like Hollywood, eh?). Bottom line, you won’t see Philip’s name in the movie credits. Makes me wonder how many Christmases he spent before his 1984 death watching the movie, and either smiling, or not, at the final result of his 1938 inspiration. We know today that the movie is an American classic, on the “100 Best American Films” of the American Film Institute (AFI), and ranked as #1 on AFI’s list of most inspirational films of all time. Yet on its release at the Globe Theatre in New York critics sniped that it was too sentimental and presented an “illusory concept of life.” Competing with Miracle on 34th Street that same year, it suffered a loss at the box office, and, although nominated for six Academy Awards, including Best Picture and Best Director, won only one, for Technical Achievement, SNOW. No kidding! Remember all the snow scenes in the movie? Seems that movie makers had always used cornflakes painted white for movie snow, but imagine the noise when the actors walked across cornflakes on set – all dialogue had to be redubbed. Russell Sherman was the special effects guy who developed “silent snow” by using a compound of water, soap flakes, foamite and sugar. Now there’s a bit of inside info for your next Trivial Pursuit game! And here’s another interesting tidbit – the FBI’s memo about the movie. Yes, Mr Potter was presented as a mean and despicable old man. Seems the FBI warned that presenting the upper class, or people with money, as “bad people” was a common trick used by Communists. “Obvious attempts to discredit bankers” was a threat to our democratic society? Capra stated that he made the film to combat atheism. And there are critics yet today who call the film terrifying (giving up dreams, we all live in a Pottersville). Television gets credit for moving the film into “classic” status by playing the movie during the Christmas season – that began in the 1970s. There you have it, how to have your 1938 “dream” turn into something people can’t do without in 2016, no matter what the critics say. I was curious about one more thing – how did the movie affect the people who were in it? 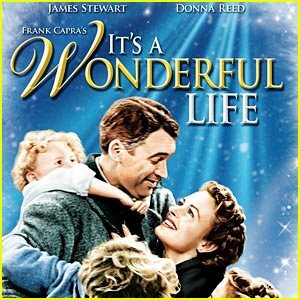 Did they have “a wonderful life” after 1946? You may be surprised. James Stewart (1908-1997), aka George Baily. Between 1935 and 1991, Jimmy Stewart was in more than 92 movies and television shows. But did you know about his military career? He learned to fly in the 1930s, and was inducted in the US Army in 1941, the first major movie star to wear a military uniform in WWII. By the time the war ended, he had flown numerous missions over Europe, been promoted to full colonel, and won military awards, including the Distinguished Flying Cross. It’s A Wonderful Life was his first movie after the war, and he experienced what we now call PTSD during the filming. The military continued an important part of his life, he was promoted to brigadier general in 1959 and was Air Force Reserve commander of Dobbins Air Force Base in Georgia. Throughout his lifetime, Jimmy Stewart was a family man, a philanthropist, a staunch Republican, and, a Boy Scout. “The James M. Stewart Good Citizenship Award” was created in 2003 and has been presented to deserving Scouts annually since. Donna Reed (1921-1986), aka Mary Hatch Bailey. During her acting career Donna Reed was in 40 movies and headed her own TV show from 1958-1966. 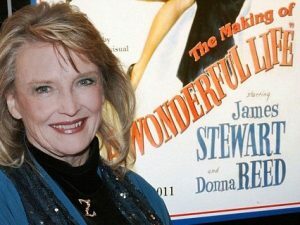 A small-town Iowa girl, she never meant to be an actress, teaching was her plan; even when she was offered an MGM contract she chose to finish her education first. Although she was born Donna Mullenger, and billed as Donna Adams in the beginning, MGM changed her name to Donna Reed due to “anti-German sentiment” during WWII. Donna was a “pin-up” girl during the war, often taking the time to write to GI’s personally. She became a peace activist during the Viet Nam war, with an active interest in politics. After her death her family and friends created the Donna Reed Foundation for the Performing Arts, offering scholarships and arts workshops. Henry Travers (1874-1965), aka Clarence Odbody, Guardian Angel. Henry’s acting career began in 1894, the stage in England, then Broadway, then film. In all, 30 plays and 52 films, his most famous film being It’s a Wonderful Life. Slightly bumbling and lovable – his trademark character. Henry retired in 1949. Lionel Barrymore (1878-1954), aka Mr Potter. Not only famous for his role as the villainous Mr Potter, Lionel also played Ebenezer Scrooge in A Christmas Carol. Lionel started out on the stage, though he claimed he didn’t want to act. On to movies – the silents, and then the talkies. His last film was in 1952, a cameo role in a musical comedy with sister Ethel. He is always seated in It’s A Wonderful Life, did you notice that? He actually was confined to a wheelchair. Medical reports vary in the telling, but claim he suffered from arthritis, which caused him to limp; he first broke a hip in 1936, then tripped on a cable in 1937 and broke his hip the second time. He has two stars on the Hollywood Walk of Fame – one for motion pictures and one for radio. Thomas John Mitchell (1892 – 1962), Uncle Billy. Absent-minded Uncle Billy was a pretty savvy actor – he was a triple crown winner, earning an Oscar, Emmy, and Tony during his career. He was also a director and writer! His last role was on stage, in the early 60s he originated the “Columbo” role that was later a TV series with Peter Falk. Beulah Bondi (1889-1981), Ma Bailey, George’s mother. Beulah Bondi played the role of James Stewart’s mother in four films, and often played “mother” roles throughout her career, though she never married in real life. Her death at age 91 came about through pulmonary complications after she tripped over her cat and broke her ribs. Remember her in The Waltons in the 70s? She won an Emmy for that. Samuel Southey Hinds (1875-1948), Pa Bailey, George’s father. Samuel was in over 200 films, mostly supporting roles, as a kindly authority figure. But he also did some Abbott and Costello! Believe it or not, he was a Harvard Law School graduate and worked as a lawyer for 32 years before getting into acting. Gloria Grahame (1923-1981), Violet Bick. Gloria’s post-1946 life was perhaps the least wonderful of any of the cast. Although she did garner a star on the Hollywood Walk of Fame, her film career began to wane in the 50s. Always worried about her appearance, she had cosmetic procedures on her lips and face beginning in the 40s, and suffered serious nerve damage. She was diagnosed with breast cancer in 1974 and sought treatment for that, but when the cancer returned in 1980 she refused further treatment. She died at the age of 57. Time now to get ready for 2017. Happy New Year to all, and best wishes for a wonderful life.